Hévíz has long been on my list of places to go in Hungary. The lake there is supposedly the world’s largest (or second-largest – depending on what you read) biologically active natural medicinal lake. Water spews forth at a rate of 410 litres per second and at a temperature of 40 degrees Celsius (104 F), keeps the lake rather temperate. In effect, this means that the lake water changes every three days (or daily; again, depending on what you read!). The city itself was a hotbed of blue-haired honeys so it was no surprise that most of those in the water that day were slightly older than yours truly. 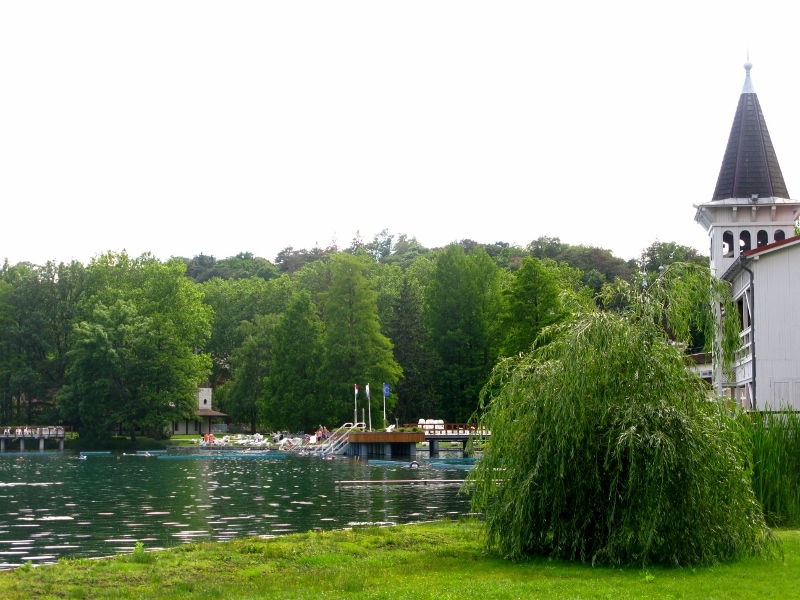 Known for its restorative powers, Hévíz lake is where the masses come to be cured. Mind you, there is a rather extensive list on the outer walls of ailments not covered by the cure. And should you have one of those, you’re advised to stay well away without your doctor’s approval. It is thought that the Romans knew of the curative effect of the lake, given the ancient coins found there in the early 1980s. Its development as a spa began in the mid-eighteenth century when Earl György (I.) 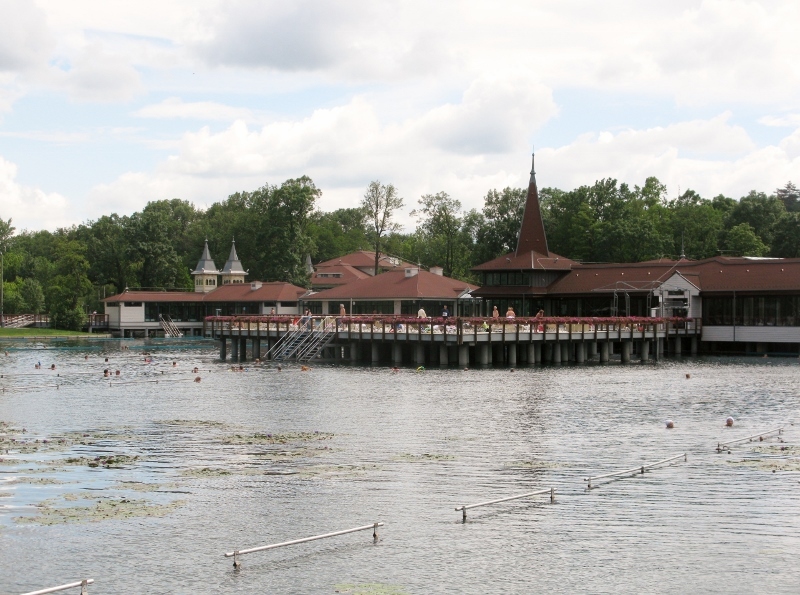 Festetics built a wooden bathing house on a float but it wasn’t until March 1868, when his son György (II.) Festetics started the building project in earnest. At the turn of the twentieth century, brewery magnate Vencel Reischl wrought his commercial magic and turned the place into a success. Replacing the old buildings with more modern hotels and restaurants and landscaping the grounds paid off. Figuring there was money to be made were he to partner with the right doctors, Reischl brought the first one in, in 1906. One of its later doctors, Dr Moll Károly, was the first to use subaquean traction treatment. This involves hanging from your neck or arms in water…. depending on what part of you needs sorting out: cervical, dorsal or lumbar spine, hip, knee, or ankle. The mind boggles. Like most other places in Hungary, the war saw a change of fate. Between 1944 and 1946 the buildings were used by the Germans as a hospital and then by the Russians. In 1948, the state took charge and the State Medicinal Bath was established by the Ministry of Health in 1952.Today, it’s a happening place, year round. When trying to find out more about the lake, I came across the term ‘health tourist’ and it made me laugh … and then stop and think. While I like the odd dip, I’m not a dedicated spa fan. And the thoughts of travelling the world in search of the ideal spa or bath or healing water seems rather ludicrous. That might change though, were I desperate to find a cure for whatever ailed me. I’ve been dubbed a ‘cemetery tourist’ but even then, I’ve never specifically gone anywhere to see a cemetery, preferring to stumble on them wherever I happened be. But each to their own. Hévíz is definitely a popular spot with Russians and Bavarians alike – with the odd Hungarian thrown in for good measure. Worth stopping by, if you’re in the neighbourhood.